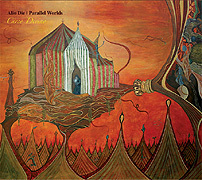 Knowing something of the individual works by Alio Die + Parallel Worlds makes their collaboration all the more interesting - as their sound worlds merge and transform on the CD Circo Divino (53'44"). Bakis Sirros records under the name Parallel Worlds. Previously he has leaned toward a tightly arranged progressive and melodic focused style of retro electronica. For Stefano Musso, his work realized as Alio Die is a restless meditation on atmosphere and texture. Their beautiful album Circo Divino represents an area neither (and few others) have previously explored. The two artists dissolve into a fascinating alliance and produce six unique pieces. Attention may be drawn to an interesting instrumentation, including a range of acoustic instruments (among them the ethereal voice of contributor India Czajkowska). But subdued trance rhythms will entice the listener with an immediate access point. Electronic sounding, the soft patterning pulses and beats writhe beneath sustaining synth chords and breathing tones. Generating an easy momentum, this dramatic aspect meets the more cerebral elements in a perfect sonic state. With its growing ambiance and ever-changing pumping, click-pop, up-down, low-key blips, this music may lull the listener into a more interesting kind of sleep - as the two artists take themselves and their listeners into unified realms.